Hydrogen is one of the most promising energy carriers of the future as it can be produced completely regeneratively. In its pure form, it can only be stored and transported under high pressure or at extremely low temperatures. In order to reduce the effort and save costs, hydrogen can be stored in organic carrier molecules. Hydrogen is only easy to handle under normal conditions when it is bound to or converted into a carrier molecule. 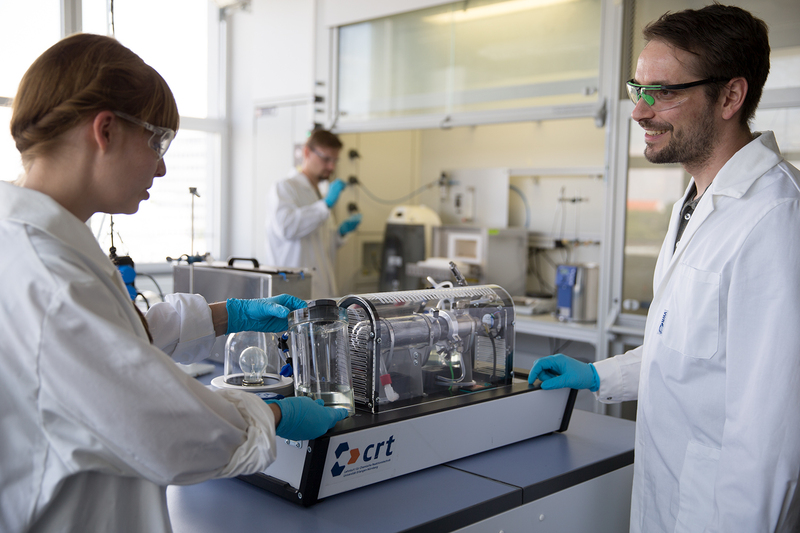 At the EnergieCampus, the economic feasibility of chemical hydrogen storage is analyzed in addition to the reaction-related implementation of hydrogen storage - above all by means of liquid organic hydrogen carriers. The close exchange between researchers in economics and engineering is therefore a central component of the research area and forms the direct interface to the subarea of energy market design. Transmission Electron Microscopy image of platinum particles on an alumina surface. The right catalyst is at the heart of every chemical process. This also applies to chemical hydrogen storage. For the production of classic hydrogenation and dehydrogenation catalysts, precious metals such as platinum, ruthenium or palladium are applied to a highly porous carrier material such as aluminium oxide. However, no two catalysts are the same and the key to a successful reaction lies in the details. For this reason, the Chair of Chemical Reaction Engineering is conducting intensive research into the development of new catalysts and their manufacturing processes. The aim of this research is to develop inexpensive, selective catalyst concepts that enable high storage and release rates in hydrogen storage plants. In particular, the precious metal content of the catalysts is to be reduced while the activity remains constant. This has been achieved in close cooperation with catalyst manufacturers. For example, the platinum content of the catalysts used has fallen to below 0.5 weight percent within the last 5 years. This represents a platinum saving of more than 90 % - with a consistently high level of activity. In addition, the carrier materials used are being examined in detail and optimized with regard to pore size and surface quality for use in the hydrogen storage facilities at the Chair and the Energy Campus. Plate reactor design as an innovative approach to dehydrogenation reactors for hydrogen storage. Hydrogen storage by means of liquid organic hydrogen carriers (LOHC) places completely new demands on reaction technology. In particular, the increase in volume due to the release of hydrogen - 1.2 liters of hydrogen are released from one milliliter LOHC - must be taken into account in reactor design and construction. However, no industrial dehydrogenations are carried out with the aim of achieving maximum gas yield. The high reaction heat of the two reactions must also be compensated. While the heat released during the highly exothermic loading of the carrier must be dissipated quickly and reliably, in hydrogen release the main task is to ensure that the reaction area is supplied with process heat efficiently and evenly. Hydrogen storage reactors therefore need to be designed and scaled differently than many reactors used in the chemical industry. These guidelines and relationships are developed at the Chair of Chemical Reaction Engineering, and are furthermore tested and specified in prototypes. The tasks range from the purely reaction-technical view, over fluid mechanical optimization and characterization up to the energetic simulation of complete plants. This work has already resulted in several reactor concepts. The dehydrogenation reactor shown in the picture is primarily used for the investigation of overflowed catalyst beds and the in-depth analysis of the gas release on a macroscopic level. The so-called oneReactor concept was also developed. In this concept, due to clever process design it is possible to carry out both hydrogenation and dehydrogenation in the same reactor using the same catalyst. This enables compact, efficient and dynamic stationary storage options with significantly reduced investment and operating costs. Schematic overview of all processes contributing to the evaluation of the different synthetic fuel supply chains. Within the framework of an interdisciplinary research project between researchers from the engineering and economic sciences, synthetic fuels are investigated with regard to their suitability as sustainable fuels for the mobility of the future. A particular focus is on the effects of different electricity market designs on the production costs of fuels. It is shown that the design of market rules can have a considerable influence on production costs as well as on the optimal design of the production process. Regionally differentiated prices have the potential to reduce mobility costs by up to 40%. In addition, it could be shown that LOHC-based hydrogen mobility enables the lowest costs for mobility through high efficiency and storage density. Experimental setup of the hydrogen compressor equipped with direct liquid cooling. In order to transport and use gaseous energy carriers such as hydrogen, these carrier gases must always be compressed. Although the time of compression along the process chain and the required pressure level differ depending on the transport or storage concept, losses are unavoidable. In most cases the heat generated during compression can only be used insufficiently. In the development of new, highly efficient compression processes, the Chair of Process Machinery and Plant Engineering (iPAT) is therefore working on innovative concepts for the use of compression heat. In addition, compression processes are optimized with regard to their application in the hydrogen economy. High final pressures of up to 1000 bar, such as those required for refuelling hydrogen vehicles, offer particular potential. On the one hand, such high pressures require the strict minimization of dead spots in the compressor. On the other hand, efficient heat dissipation from the compression chamber is a major challenge. An innovative compressor concept developed at iPAT provides for internal liquid cooling in the compression piston. The compression heat is transferred directly to a cooling liquid, which can be used, for example, to supply heat to another process. In combination with liquid organic hydrogen carriers such as dibenzyltoluene, the carrier material is heated directly for the release reaction. Since the liquid film on the piston wall also reduces the cylinder clearance to almost zero, highly efficient compression processes are possible.